As a writing teacher, I often surprise people and tell them that I teach the same things regardless of the audience. It doesn’t matter if I teach a fiction class to a 3rd grade class or a class of advanced novelists, the techniques are the same. Of course, the sophistication of the finished writing project is another story. But really, fiction is fiction. There is character, plot, setting, theme, descriptions, action, and so on. The language of story remains the same, the techniques remain the same, regardless of where I teach. I am reminding myself of this truth because I realized I was stuck in a rut, thinking about my own writing in certain terms. I write middle grade fiction. I would never write __________(fill in the blank here with a long list of no-nos). Or, try this one: I write fiction. I would never write nonfiction. This summer, I am challenging myself to stretch for new audiences, new genres. I am writing an adult sff (science fiction fantasy—the abbreviation used by most in the field) short story. Whoa! Adult audience. Short story. Only the sff feels comfortable. This summer, I am working on a book proposal for a nonfiction, nature book for middle grade audience. Now, I’ve done nonfiction nature picture books. But a book proposal? Middle grade audience? Why stretch? Because I have gotten stagnant and need to find new enthusiasm for projects that I can write with passion. I didn’t have to change audiences, genres, forms, I could have just found a renewed passion for old paths. But as much as I like habits—and I really like my habitual world—I also like going new places and doing new things, as this photo proves. I think my writing needs that, too. 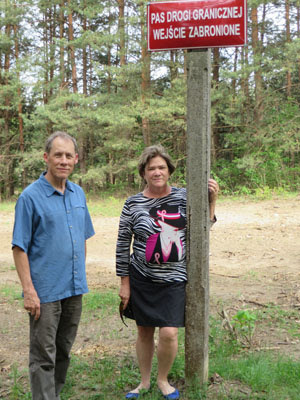 Standing on the border between Poland and Ukraine, May 2013. What about your writing? What bold new projects will you attempt? I am a creative nonfiction writer--little slice-of-life stories--but last year I wrote a couple of fictional pieces, and really enjoyed the process. Were they published? No yet, but I haven't given up on them. I think as writers, if we don't try new things, we're like most kids and food: we avoid trying unknown foods, saying, "I don't like it," without even tasting them. How do we know unless we at least take a bite? Nibble on an untried genre. Try your hand at something new. You might really like it. I completely agree with the advice in this post. I got stuck in a rut for so long writing and selling parenting articles. I still do that, and edit a regional parenting magazine, but a whole new sense of fulfillment (and markets!) opened up before my eyes once I started dabbling in flash fiction and writing for children, too. This is the exact article I needed to read at exactly this time in my writing career. Thanks for sharing. I have been saying for a year now I am going to blog a book--I keep saying something about parenting, but now I'm thinking something about being in the sandwich generation. I need to set a goal and do it! Like Margo, I'm trying to set a goal and do it. I want to get back into book writing. After all, I can't sell it if I don't write it and send it out...Step 1. Get finished material out. Step 2. Finish more. Step 3. Repeat step 1.